home Home arrow_right Forums arrow_right Communities arrow_right Games arrow_right You are banned! A: You are banned for viewing this! B: @A you are banned for banning! You are banned for banning me! you are banned again for having one emerald on your comment. TNHo﻿ You are banned for spamming badly edited error screens! Want to know how I made the error messages? For the swirls and black holes, I went to some image editing website and added swirls. 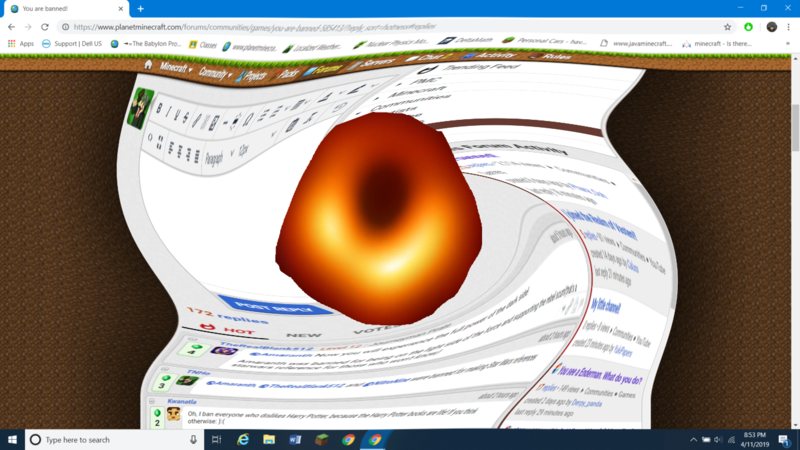 And I edited in the first picture of the black hole into that error below using paint.net. If you like Fornite more that Minecraft You are banned! TNHo was banned for destroying this thread with a black hole! 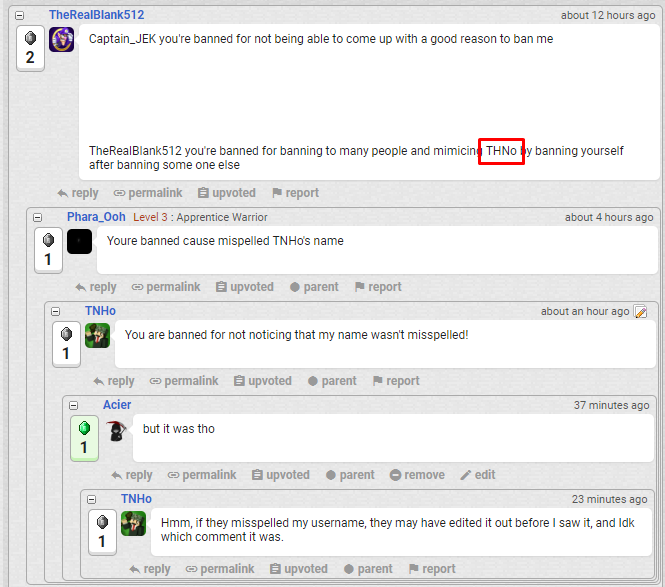 TNHo﻿ banned for horrible photo editing. I'll see your Harry Potter and raise you a Lord of the Rings. Now YOU are banned because you put a false message here! You contradicted a well know truth! Ha! You're outnumbered! Banned for losing! Amaranth Now you will experience the full power of the dark side! BTW how do you gte the links to their profile? I ban @Phara_Ooh for making this not about Minecraft. I ban everyone participating, because the very idea of this game is so stupid (Jk, it's not bad). Okay here I go! *swings around with a squeaky toy banhammer* Darth Spookoden you are banned for being on the side of the Sith. I ban TheRealBlank512﻿ for banning a jedi. TNHo is banned for thinking he can write just one paragraph to explain this, And for having a really weird username. Also nice ban. So you are banned for banning and being banned And for being TheRealBlanks512 especially because of the 512?